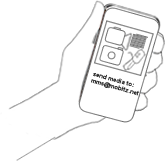 Launch your own moblt - a media channel - from the web or from your phone using a special code. Send the code to your friends so they can contribute. You can embed your channel in any web site. Watch it grow from your own blog or page!